Years after the disaster at Jurassic World, a rescue mission is set to retrieve the dinosaurs from Isla Nublar where a volcano threatens all living species. This mission soon turns for the worst with the dinosaurs being auctioned off to the highest bidder as weapons. Owen (Chris Pratt) and Claire (Bryce Dallas Howard) must stop these creatures being sold off for the world's sake. 'Fallen Kingdom' starts off with a horror-esque, dark and creepy sequence with director J.A. Bayona showcasing his talents yet again using larger than life creatures. This suspenseful scene joins the original 'Jurassic Park' as one of the best starts in the franchise's history and offers hope for the remainder of the film. Unfortunately, there is little of this creativity and originality to be found in the rest of the film. The latest installment of the 'Jurassic' series may as well be titled 'Greatest Hits' as the film is filled with moments found in previous films with little more to them. Audiences will feel the nostalgia being forced upon them as the film tries to re-create classic scenes and moments with updated CGI and technology. The problem is that the film doesn't have the magic and engagement of the audience to get the maximum effect from these scenes. Due to this, it just seems like a cheap imitation more often than not. Unfortunately, there isn't much to rave about in terms of new additions to the series, with a potentially interesting look at John Hammond's relation with previous partners being squandered for more explosions and dinosaur attacks. The 'Jurassic' series now has very little meaning to it, other than dinosaurs being a metaphor for nuclear weapons, with the action spectacle being the main feature. The biggest strength of the film comes from its casting, with Chris Pratt's unquestionable charm and charisma making the film a lot more enjoyable. His pairing with Bryce Dallas Howard works tremendously yet again, giving the audience a genuinely likable pairing to root for. Rafe Spall and Toby Jones provide good support in villain roles with greedy motives and although not given much to work with, leave a lasting impression on the film. With better material, this cast could do wonders with a wide range of quality actors featuring but we just have to settle with them making the film watchable. 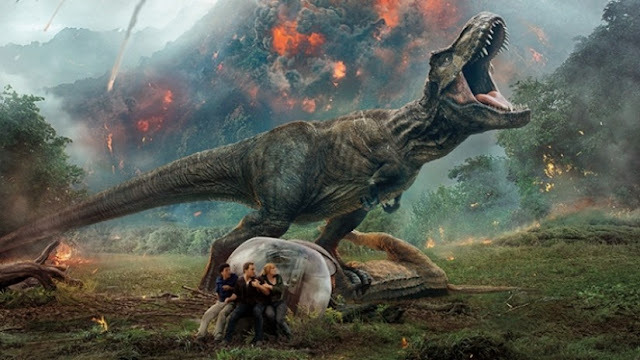 'Jurassic' is undoubtedly now just another franchise that offers very little to be excited by. We can expect sequels to come out every other year but they won't be much different to each other or worth the time. It's a shame to see this series go further and further away from what made it so great in the first place. 'Jurassic' is now just another 'Transformers' or any other franchise that is just being milked for money which audiences will eat up undoubtedly. As far as generic blockbusters go, 'Fallen Kingdom' ticks all the boxes and although it's watchable, it offers a very limited experience in terms of shocks, thrills and excitement.